The original Creative Aurvana Live!, often referred to as the CAL!, has been a budget-friendly audiophile favorite for as long as I can remember. Built around 40mm drivers with bio-cellulose diaphragms, the CAL! 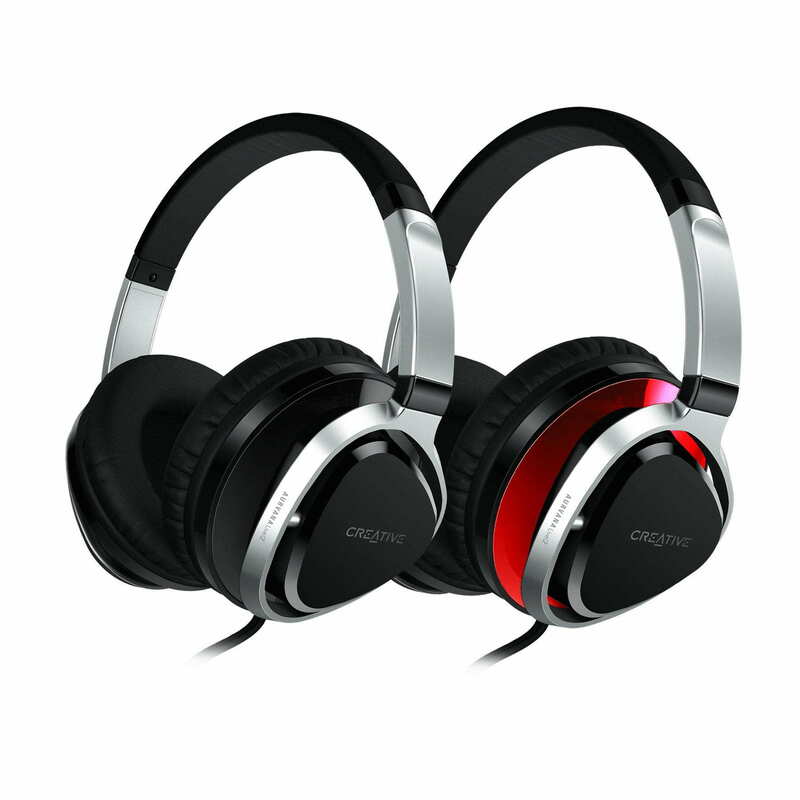 delivers a warm and lush sound with plenty of bass and good clarity. It is also one of the most compact fully circumaural headphones on the market, and one of my personal favorites for wearing comfort thanks to the spacious ear cups and the extremely light weight of its plastic structure. Six years after the release of the original CAL!, Creative has given the headphone a redesign and released the Aurvana Live! 2. As a fan of the original, I jumped at the opportunity to try out the new version. I was slightly apprehensive of the manufacturer-supplied product shots of the new CAL!2, which make it look bulky. Lots of parts appear to be metal, and therefore heavier compared to the original CAL!. However, I am pleased to say that the new headphone stays very true to its predecessor. The design is in my opinion quite elegant – the metal-looking parts are in reality plastic but have a pleasant “sandblasted” finish to them. The cups are a little thicker overall compared to the last model, largely due to the way they attach to the headband, but the headphones don’t look too big on the head. Overall, I like this aesthetic better than the previous CAL! and the competing model from the Denon, the D1100. More importantly, the plastic structure keeps the weight low. The cups, too, are nice and deep, as with the previous model, and the pads have a large internal diameter. All this yet again makes the new CAL! an absolute standout in wearing comfort — it is easily the most comfortable portable circumaural headphone in my possession. Not everything remains unchanged, however – the construction of the CAL!2 feels a little more solid in the hand than that of the old model, but also has more moving parts — the new CAL! has gained the ability to fold flat for transport and storage. It also has a detachable cable with a 2.5mm connector at the earcup end. While I would have preferred the more common 3.5mm, at least it’s not proprietary and quality replacements aren’t difficult to come by. The stock cable has an inline mic and remote, along with an analog volume control. I rather like its configuration, which splits up the remote and microphone into two separate modules, positioning the mic a few inches above the remote for better voice capture. The analog volume control slider means that the remote works not only with Apple devices, but most Android and Windows Mobile phones as well. Listening to the CAL!2 makes it clear that Creative has chosen not to mess with a good thing too much when it comes to sound. The CAL!2 is a warm-sounding headphone with impactful bass. It has great clarity and good treble energy, and doesn’t sound closed-in or congested. Detail resolution is excellent as well. I compared it to a few of the other bass-heavy sets I have on-hand, including the Monster DNA ($200), V-Moda Crossfade LP2 ($200), Munitio PRO40 ($350), and Velodyne vTrue ($400). The $130 CAL! came out as my favorite among all of these with the cleanest, most natural sound and minimal bass bloat. All in all, the CAL!2 seems to be just as easy to recommend as the original CAL!. It’s not the best headphone for accuracy but has the perfect consumer sound – warm, impactful, and smooth even at high volumes. It’s also super comfortable and, as before, the price is right, with similarly-performing headphones from other big-name brands easily running into the $200 range and higher. The original CAL! is still a great choice, especially as it’s often discounted well into the sub-$100 range, but once the supply runs out at least we’ll have a worthy replacement. Full review to come next year… in the meantime, the CAL! is already available on amazon in both black and red. Hi, hopefully you still look at these comments. Simple question, I have the option of getting the Cal! 1 for 57 bucks vs the red Cal! 2 for 109. Is the Cal! 2 worth the extra 52 dollars? It depends on whether you want heavy bass or not. If you want heavy bass, the CAL!2 is absolutely worth it because the CAL! won’t do what you want. If you’re fine with a more balanced sound, then that CAL! is going to be the better value for sure. Thanks for the reply! I really like the sound signature of the portapros which I suppose resemble the Cal 2, correct? CAL!2 is bassier. I’d rather have the original CAL! as a PortaPro replacement – it’s closer in balance.